Elmato is still feeding 1.1 MSSR so long after bsip59 took effect. This kind of witnesses who ignore the community consensus are still supported by the proxy, why? 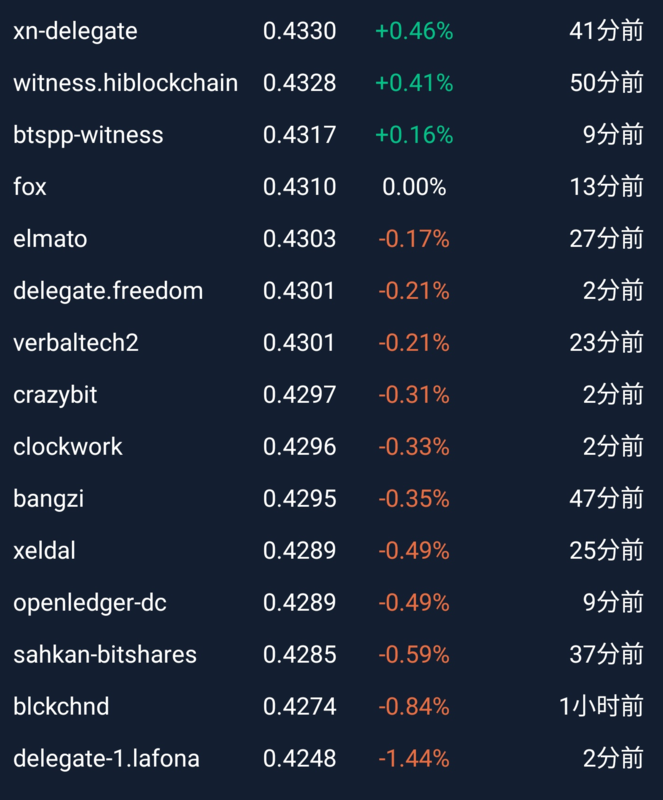 update my selection: now I vote magicwallet.witness, verbaltech2, sahkan-bitshares and elmato. 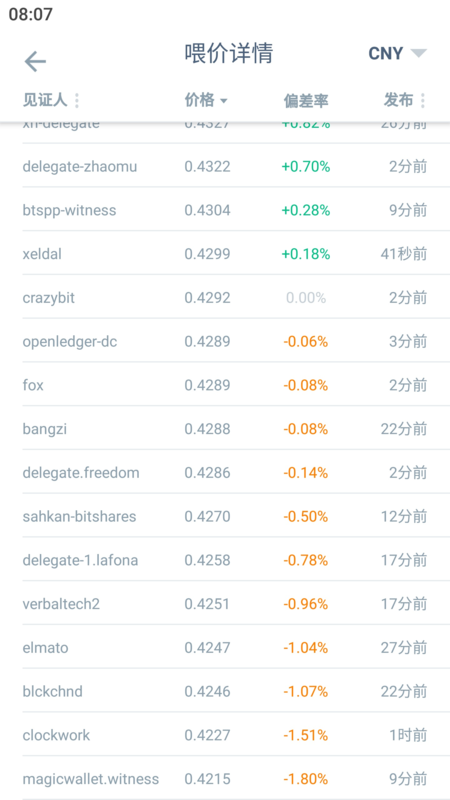 as shown below, at the moment DEX price is 0.4157bitCNY, bitCNY has about 1.8% premium, a good feed price should be about 0.4157*1.018 = 0.423. If an witness feed price which is 4%+ lower than such a price, I don't think he did a good job. and elmato seems pay little focus on BTS now, he even feed MSSR=1.1 now, ignoring community consensus. I think you meant to say that you "unvoted" us. Seems to me that everyone is within the specified 4%. Also I am one of the few (if not the only one) that uses paid price feeds so my feeds report changes a bit faster than the rest of the network. paid price feeds does not mean good price feeds. it's not difficult to know what is the exact BTS price at a moment without rapid price change. 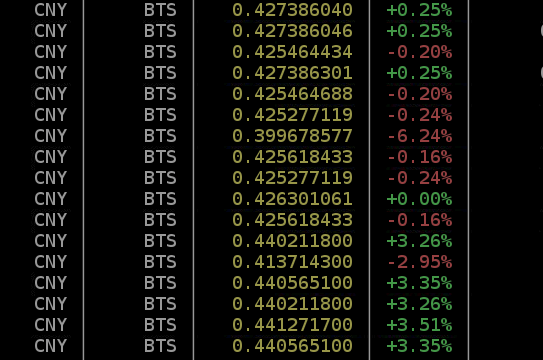 when I do below screenshoting, DEX price is of 0.4266, bitCNY has a premium of about 1.8%, BTS price should be about 0.434CNY. 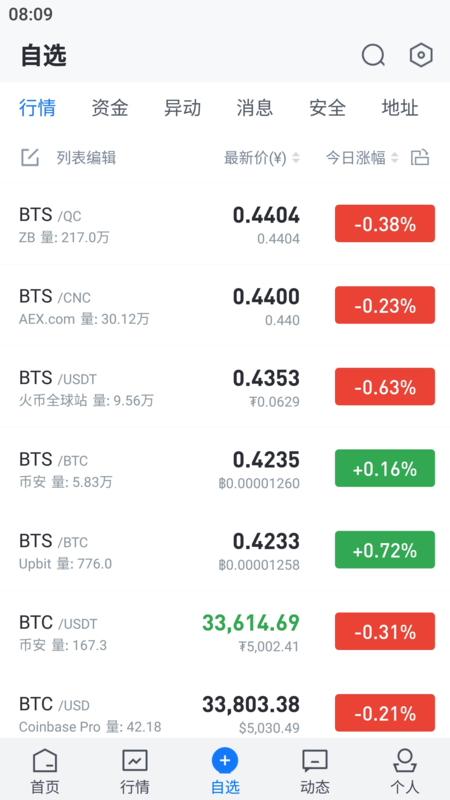 at huobi BTS has a price of 0.0629 USDT and in OTC market 1USDT = 6.92CNY, so BTS price should be 0.435CNY. but both paid price feeds gave price 1%+ lower than the market price. We can't simply publish high prices because it suits some people. same goes for low prices. my point is that we need to pay more weight on DEX price. 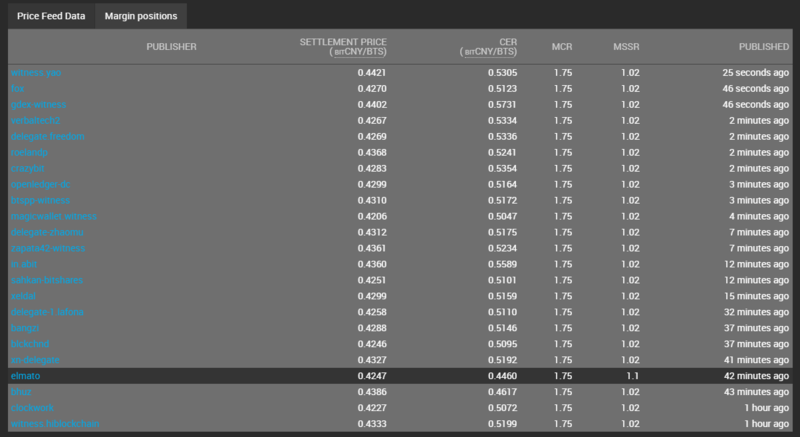 when market is stable and no unusual issues happen in DEX, price feed should not be lower than Pdex. that's why I suggest to feed price based on DEX price and bitCNY premium/discount. who know where there is an CEX has a price of 0.399? if there is, just arbitrage between it and DEX. 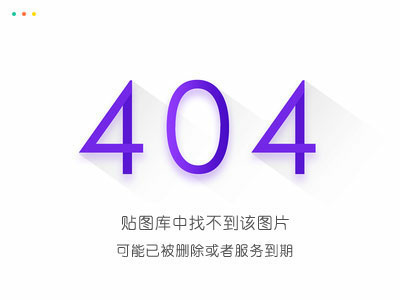 and I greatly doubt that your calculation does not considered the premium of USDT, recently, 1USDT=6.92CNY but the official USD/CNY rate is about 6.71. USD -> BTS? where can buy bts with USD? BTS ->BTC -> USD ->CNY? is this some of witness feed price?!!!!!!!!!!!!!!!!!!!!!!!!!!!!! Now the feed price just become the fake price, i can't use the feed price to buy 1 bts from the CEX.